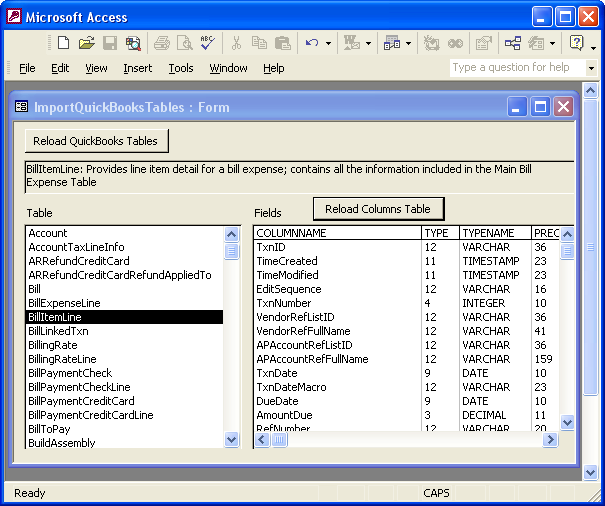 Many ways exist to view the QODBC - QuickBooks® table schema; however, a form that queries the tables with a mouse click is by far the handiest. This three part tutorial explains how to create a form like the one illustrated below, depending on your particular design preferences. Before you can do anything with QODBC, you must know the names of the tables. You must also know the field names available for each table and each field's properties. For example, to write an SQL statement to retrieve a customer, you need to know the name of the customer table first. Second, you need to know the field names you wish to retrieve to avoid querying all the fields. Querying only the fields you require for your database saves time. What is a field property? If you are familiar with spreadsheets, a QODBC table resembles a spreadsheet. The rows are the records, the columns are the fields and the cells are the values. For example, if you try to insert or update a value for the FullName field of the customer table, you will produce an error. 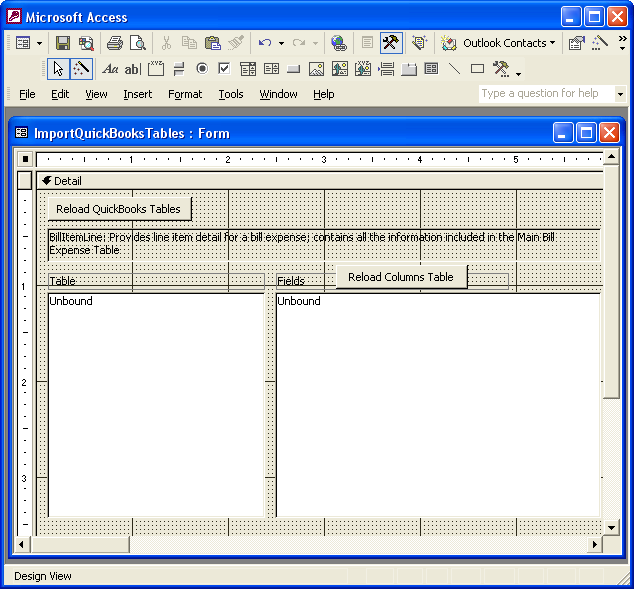 Copy these column widths and paste them into Microsoft® Notepad and then copy them from Notepad into the Column Widths text area of the lstFields ListBox. If you try to paste them directly from the web page, you will produce an error. You will change these later to suit yourself but this will get you started so you can see the data. 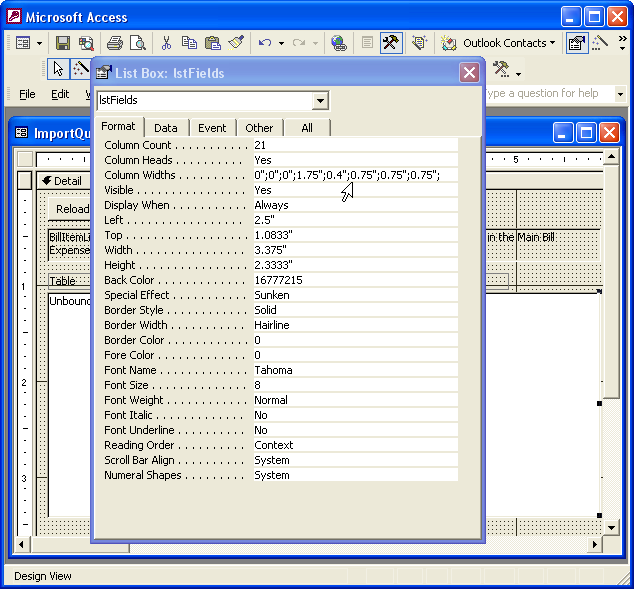 Find the Column Widths line and paste the numbers from above into the text box; right above where the cursor arrow appears on the screenshot below. You may make both the ListBox and the form wider than what is shown above. The width shown above is narrow to accomodate the web page while allowing original picture size for clarity. Next, you'll paste the code. can this step by step process be applicable in MySql? "QODBC is a fully functional ODBC driver for reading and writing QuickBooks 2013-2002 accounting data files by using standard SQL queries. It requires an ODBC compliant front-end application such as Microsoft Word, Microsoft Excel, Microsoft Access, Visual Basic, PowerBuilder or Delphi. Once installed, it will allow these applications to read and write QuickBooks Accounting files in the same fashion as other file formats installed on your computer."